About 20 minutes on two of my favorite works of sacred art. Scroll down to Class 9. Most Catholics are unaware of the fact that our traditional church buildings are based on designs given by God Himself. Their designs stretch all the way back to Mount Sinai, when God set forth the design for the sanctuary in the desert and the tent of meeting. Many of the fundamental aspects of our church layouts still follow that plan and the stone version of it that became the Jewish Temple in Jerusalem. Our traditional church buildings also have numerous references to the Book of Revelation and the Book of Hebrews, both of which describe the heavenly liturgy and Heaven itself. There is not time to develop these roots at length in this post today, though I hope to do so in a series of future posts. Sadly, in recent decades there has been a casting aside of these biblical roots in favor of a “meeting house” approach to church design. No longer was the thinking that our churches should reflect heavenly realities, teach the faith, and follow biblical plans. Rather, the idea was that the church simply provided a space for people to meet and conduct various liturgies. In some cases the liturgical space came to be considered “fungible” in that it could be reconfigured to suit various needs: Mass today, concert tomorrow, spaghetti dinner next Wednesday. This thinking began to be set forth as early as the 1950s. Pews were often replaced by chairs, which could easily be moved to suit various functions. And even in parishes that did not go so far as to allow spaghetti dinners in the nave (mine did in the 1970s), the notion of the church as essentially a meeting space still prevailed. Thus churches began to look less and less like churches and more and more like meeting halls. The bare essentials such as an altar, pews or chairs, a pulpit, and very minimal statuary were still there, but the main point was simply to provide a place for people to come together. There was very little sense that the structure itself was to reflect Heaven or even remind us of it. That is beginning to change as newer architects are returning more and more to sacred and biblical principles in church design. 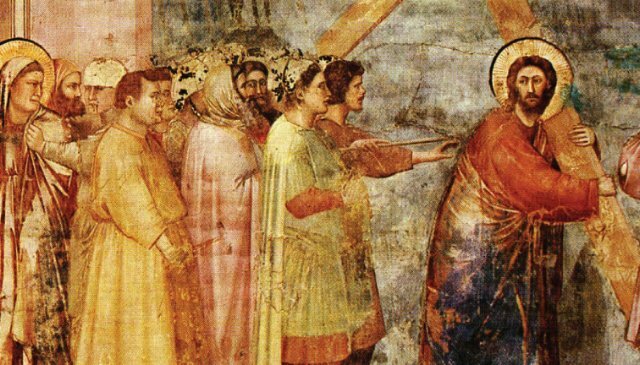 Further, many Catholics are becoming more educated on the meaning of church art as something more than merely that it is “pretty.” They are coming to understand the rich symbolism of the art and architecture as revealing the faith and expressing heavenly realities. Take stained glass for instance. Stained glass is more than just pretty colors, pictures, and symbols. Stained glass was used for centuries to teach the faith through pictures and symbols. Until about 200 years ago, most people—even among the upper classes—could not read well if at all. 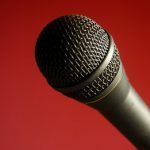 How does the Church teach the faith in such a setting? Through preaching, art, passion plays, statues, and stained glass. Stained glass depicted biblical stories, saints, Sacraments, and glimpses of Heaven. 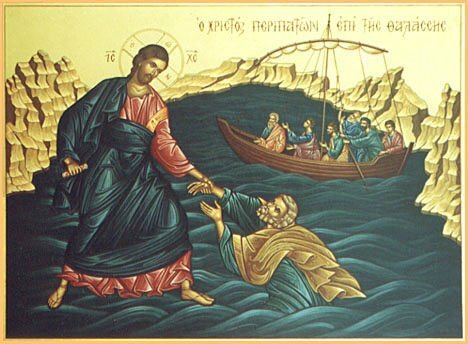 Over the centuries a rich shorthand of symbols also developed: crossed keys = St. Peter, a sword = St. Paul, a large boat = the Church, a shell = baptism, and so forth. 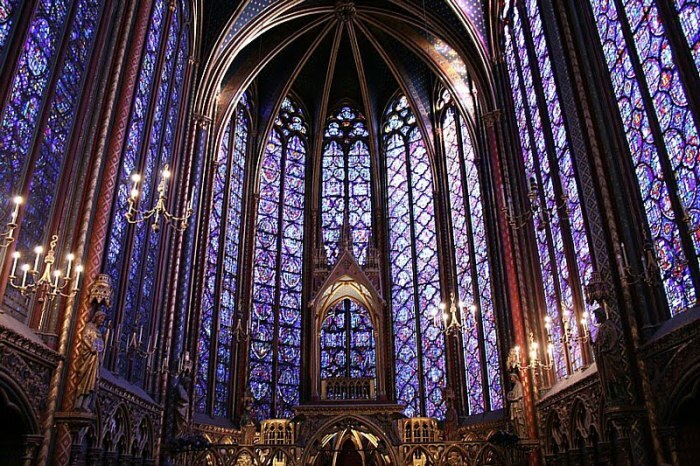 And so the Church taught the faith through the exquisite art of stained glass. 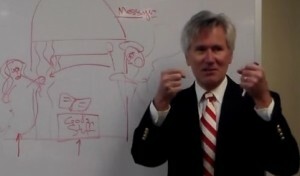 One of the seven angels … showed me the Holy City, Jerusalem, coming down out of heaven from God. 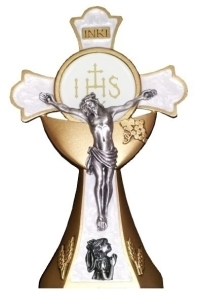 It shone with the glory of God, and its brilliance was like that of a very precious jewel, like a jasper, clear as crystal. It had a great, high wall with twelve gates … The foundations of the city walls were decorated with every kind of precious stone. The first foundation was jasper, the second sapphire, the third chalcedony, the fourth emerald, the fifth sardonyx, the sixth carnelian, the seventh chrysolite, the eighth beryl, the ninth topaz, the tenth chrysoprase, the eleventh jacinth, and the twelfth amethyst ... (Revelation 21:varia). Thus because Heaven had great, high walls, older churches almost always had a lot of verticality. The lower foundational walls gave way to the higher clerestory and above the clerestory the vaults of the ceiling rose even higher. And in the lower sections of the walls, extending even as high as the clerestory, the jewel-like stained glass recalled the precious gemstones described in the lower walls of Heaven. The compelling effect of a traditional church is to say to the believer, you are in Heaven now. In my own parish church, the floors are a green jasper color, and the clerestory walls, red jasper. 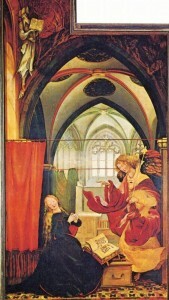 On the clerestory are painted the saints gathered before the throne-like altar in Heaven (Heb 12:1; Rev. 7:9). In the apse is the throne-like altar with Jesus at the center (Rev 5:6); the seven lamp stands are surrounding him with seven candles (Rev 4:5). In the stained glass of the transept are the 12 Apostles joined with the 12 patriarchs (symbolized by 12 wooden pillars). Together they form the 24 elders who surround the throne in Heaven (Rev 4:4). Above the high altar, in the clerestory windows, are the four living creatures also said to surround the throne (Rev 4:6-7). Yes, it’s amazing! 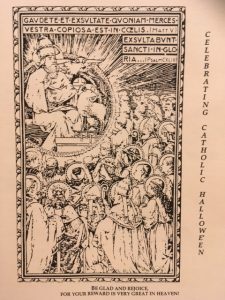 I stand in my church and realize its message: you are in Heaven when you enter here and celebrate the sacred mysteries: sursum corda (hearts aloft)! The photo above is of the Sainte-Chapelle, a royal medieval Gothic chapel located in Paris, France. Here’s a video I put together on stained glass. Enjoy these jewels of light that recall the lower walls of Heaven as you listen to the choir sing “Christe Lux mundi” (O Christ you are the Light of the world). And finally, if you are interested, here is a video I made some time ago featuring some of the architectural details of my own parish. 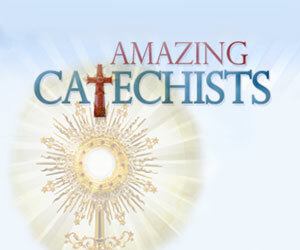 Amazing Catechists welcomes Monsignor Charles Pope as a new contributing author to Amazing Catechists. Msgr. Charles Pope is the pastor of Holy Comforter-St. Cyprian, a vibrant parish community in Washington, D.C. A native of Chicago with a bachelor’s degree in computer science, his interest in the priesthood stemmed from his experience as a church musician. He attended Mount Saint Mary’s Seminary and was ordained in 1989. A pastor since 2000, he also has led Bible studies in the U.S. Congress and at the White House in past years. 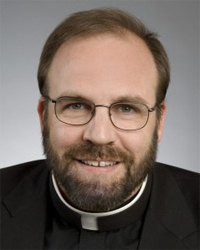 Monsignor Pope is often featured in New Advent and Our Sunday Visitor and is the primary author for the Archdiocese of Washington’s blog, and we are honored that he will be sharing some of his best blogs on theology, art, music, and culture here at Amazing Catechists. Monsignor Pope has just released his first book The Ten Commandments by TAN Books, a division of Saint Benedict Press. Let’s jump right in: I read Die Weise von Liebe und Tod des Cornets Christoph Rilke for the first time in 1982. Here’s that backstory, but you don’t have to look at it. All you need to know is that it’s a prose poem in German, and an elegant introduction to the language. 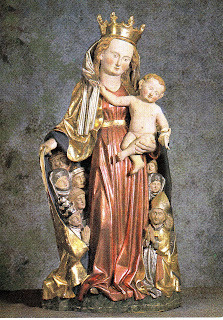 It’s called the Darmstadt Madonna. 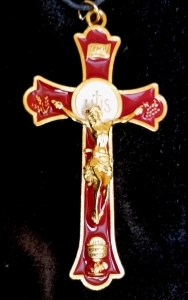 It follows a standard formula in which the patron (in this case, Jakob Meyer, mayor of Basel, Switzerland) is at the right hand of Jesus, the Trinity, or a saint; and other members of the family, both dead and alive, are distributed starting at the central character’s left hand. 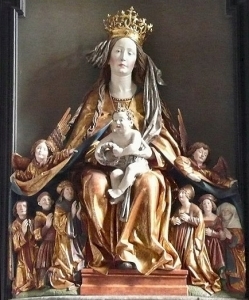 Notice in this case that although Mary is physically dominant, nobody looks at her: the patron focuses his gaze on baby Jesus, as does Mary herself. That’s a little Catholic digression about a content-packed painting which is not the subject of this post. Looks just like his Momma. Is the Son’s swaddling cloth overshadowing his Mom? Even popes and bishops want in. 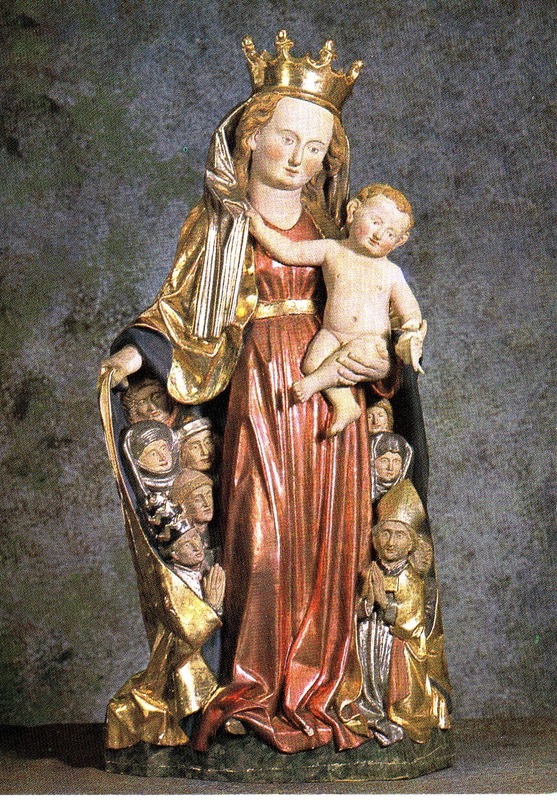 The Schutzmantel Madonna is such a vivid image that I want to get a statue like these for catechism class. It’ll fit right in with our recurring theme of overshadowing. Yeah, I could print off a nice lettersize handout of one of these photos (and I may do so regardless) but a 3D teaching tool works better than its 2D version. And the Schutzmantel isn’t just a religious concept. 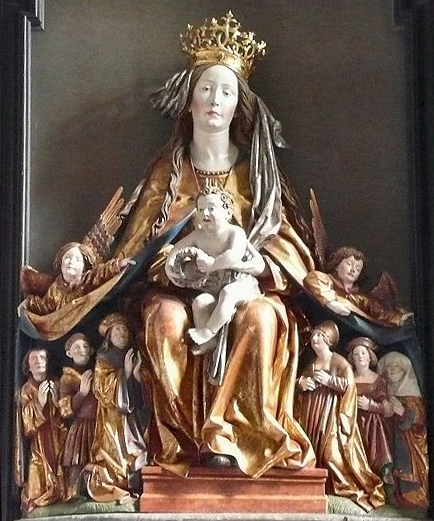 The traditional way a German man would legally demonstrate his adoption (or legitimization) of a child was to publically extend his mantel over the child; so Mary isn’t simply protecting a bunch of people- she’s adopting them as her children. There’s just something about a statue that’ll make that point better than a picture. 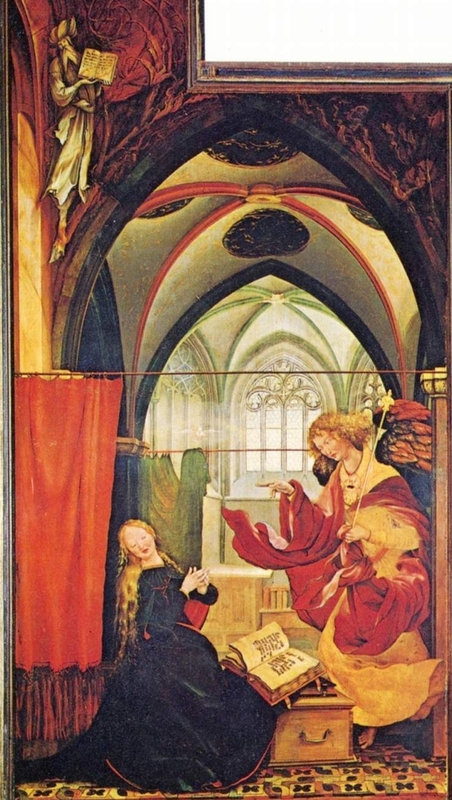 But for class we’ll first do a quick skit of Mary extending her beach towel mantel over a couple of her peers. 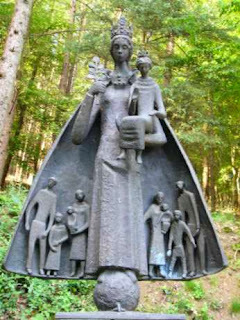 Once the kids figure out its significance, then I’ll pull out the statue, we’ll discuss some of the German history behind it, and connect it to the Bible examples we’ve already covered. Then right before class is over I’ll distribute a Schutzmantel Madonna handout, and have the kids explain to me how they are going to explain it to their parents for homework. Figure no more than 5 minutes on the skit and statue; no more than 2 minutes on the handout and quick review. They’re both in San Vitale, which was consecrated in A.D. 546. St. Apollinare was consecrated in A.D. 549, so it’s no surprise that the art is similar. I suppose they were done by the same artists. 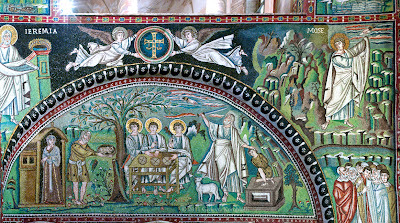 But next year I’ll use the St. Apollinare mosaic to discuss the Mass instead of using the two San Vitale mosaics twice in the same year. 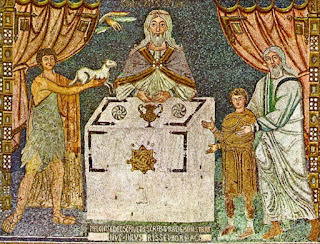 I’ll point out that the mosaic of all three men and their offerings together around a common altar directly illustrates that line in the Mass. 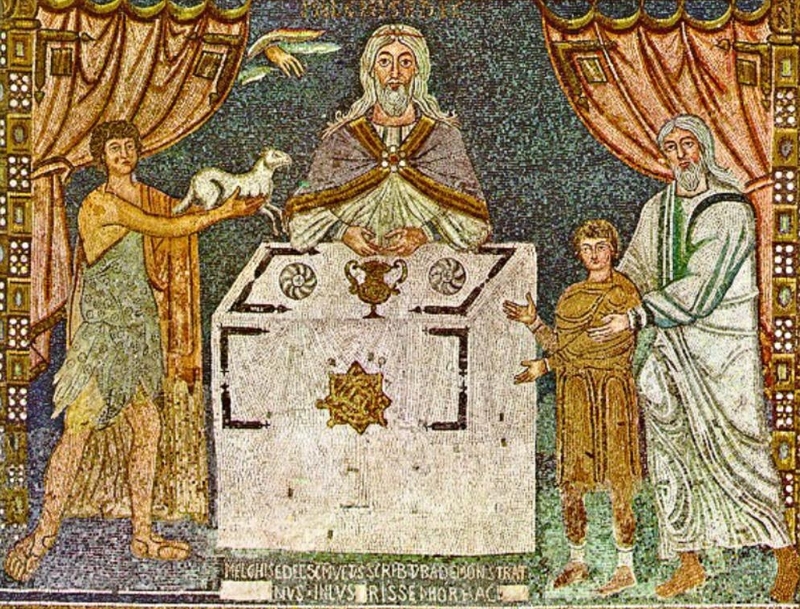 It shows that early on, the liturgy was explicitly connecting their sacrifices to the sacrifice re-presented at Mass. Like a lot of things in Catechism class, I can always tell this to the kids. But when they can see it for themselves they learn better.